February is a busy month at Newman University. The university celebrates St. Maria De Mattias Feast Day, Cardinal Newman’s birthday, homecoming, and the ever-popular event, High Tea. 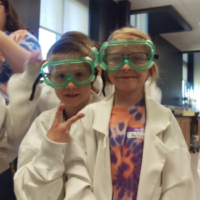 February, known as Heritage Month at Newman, began as a few small events that grew over time to become an entire month filled with activities and events that celebrate the heritage of Newman University, its founders and its namesake. High Tea, in particular, was created to honor the English heritage of university namesake John Henry Cardinal Newman. (left): Ralph & Helenruth Welsby, 1996 High Tea. 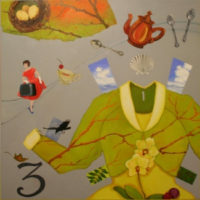 (right): Helenruth Welsby, 2018 High Tea. John Henry Cardinal Newman lived from 1801-1890 in England as well as Ireland. During much of his life, the period was known as the Victorian Era. It was part of the English tradition to host an afternoon tea, so it seemed appropriate to commemorate his life and legacy with having tea in the English fashion to which Newman was accustomed. High Tea has been celebrated during Cardinal Newman Week since its founding in the mid-1980s. To some, the celebrations for Cardinal Newman felt too short. Deanna Zitterkopf, professor emerita in English and her colleague Jeanne Cardenas, professor emerita in English and communication, wanted to expand the celebrations for such an important individual. “I wanted to do something that made a nice statement,” said Zitterkopf. 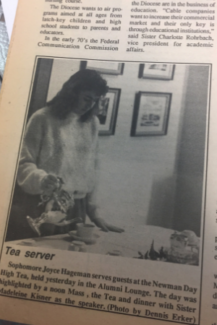 She and Cardenas came up with the idea of High Tea and it has become a staple of Cardinal Newman Week and Heritage Month ever since. High Tea attendees are urged to wear their fancy hats, sip British tea and enjoy traditional English treats as they mingle with friends and colleagues at the event. The event is always complete with floral arrangements, fancy trays for the treats and English tea sets on the tables for decoration. Over the years, High Tea has been held in various locations around campus, yet the spirit of High Tea has always remained a Newman community cooperative project. Through the years, the High Tea has been hosted in the former alumni lounge, now the business office; the gathering space within St. John’s Chapel during the 1990s, the Gorges Atrium and now the Dugan-Gorges Conference Room. The first High Tea was held on the ground floor of the administration building. 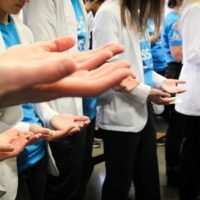 “It wasn’t super classy, but it was something unique and different,” Zitterkopf said. 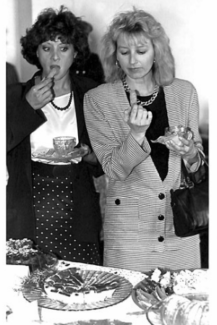 Two women enjoy High Tea in 1991. She had traveled to England often and while there, gathered some traditional English recipes and some Earl Grey tea to make the first High Tea as original as possible. 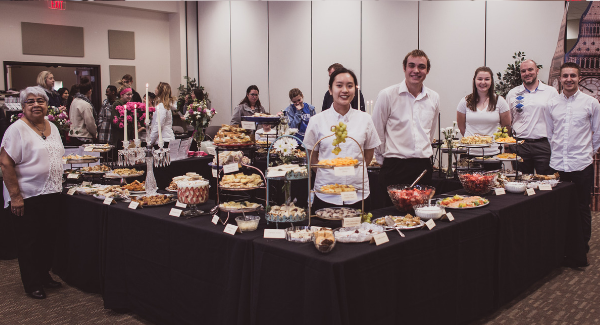 Traditional English tea dishes such as lemon curd tartlets, cucumber sandwiches, strawberry trifles, currant scones, almond biscuits and more are prepared by faculty, staff, students and even some members of the Newman community. Volunteers help with the cutting and plating of the food, the serving of the food and washing the dishes afterward. Zitterkopf realized that this event would simply be called ‘afternoon tea’ in England but everyone insisted on calling it ‘High Tea’ and the name stuck, she said. “I am proud that I had a role in the origin of High Tea,” Zitterkopf added. 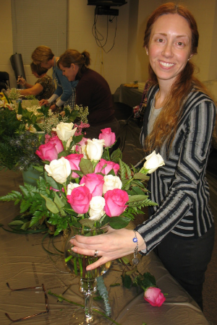 Professor of English Susan Crane-Laracuente prepares flowers for the 2011 High Tea – a task she still takes on today. High Tea has become an event that many look forward to each year. 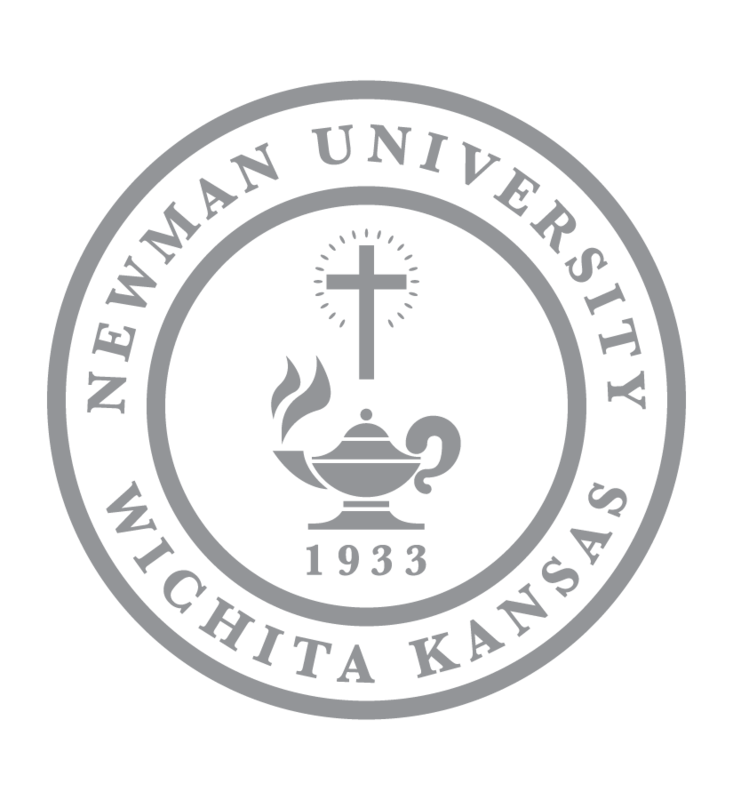 Attendees look forward to the event that fosters a sense of community and celebration of an individual very special to Newman University. The 2019 High Tea is scheduled for 2-4 p.m. and 5-7 p.m. Tuesday, Feb. 19 in the Dugan-Gorges Conference Center.